Who is dreaming to swim with wild dolphin? Who is dreaming to come to Hawaii? Blue Hawaiian Water is waiting for you. When I have time I jump in water, expecting to see something special then I usually do. Hawaiian spinner dolphins, Honu the Hawaiian green sea turtles, Octopus, all kind of rays and tropical fish. Snorkeling in Hawaii is once in your life time, must things to do in Hawaii. Usually water is calm and warm. Very good chance to see Hawaiian green sea turtles! Hawaii is one of the lucky place you can see the sea turtle with snorkeling. Hawaii Real Nature offers two choice to enjoy the way in Hawaii snorkeling. One is Hidden West Oahu Tour and Snorkeling, we go historic site, nature views, beautiful isolated white sand beaches and enjoy snorkeling end of the tour with two professional guides and photographers. Another offer is the 100% custom private tour which is made by you. Simply you tell us briefly what you would like to do/see, we will make it happen as much as we can. Snorkeling, surfing lesson, skin diving lesson, beach popping specially it is coming winter, Hawaii is surfer’s mecca. There is amazing wave in North Shore Oahu. Even you are not surfer you will enjoy how powerful wave is in North Shore Hawaii. The sounds of wave is really impressive. Contact us, we will make your perfect Aloha Day! It’s about 3000 spinner dolphins migrate in Hawaii islands. Hawaiian spinner dolphins are 1.7 to 2.2 meters, 25 to 75 kilograms. Spinner dolphins are known for their acrobatics and aerial behaviors. A spinner dolphin comes out of the water front first and twists its body as it rises into the air. When it reaches its maximum height, the dolphin descends back into the water, landing on its side. A dolphin can make two to 5.5 spins in one leap; the swimming and rotational speed of the dolphin as it spins underwater affects the number of spins it can do while airborne. Spinner dolphins are not really “friendly dolphin”. They usually don’t play with human, they will try to running away from you so please when you find a spinner dolphins in water do not approach them,, just wait they start approach you. The spinner dolphins sometimes come up to you, check you out or say hello, sometimes they accept you to be in the their pod. When I am photographing spinner dolphin in Hawaii, I see the dolphins front of me then I look at my behind there are 100 dolphins surround me. It is WOW, It is amazing experience. Photo Gallery ZERO and Hawaii Real Nature Tour have private tour goes to one of the Hawaiian spinner dolphins playground. We do not use a boat which harass them. We are going to look for dolphins from the beaches, chances are I can say 70% but this tour is not only for the dolphins we can take you hidden west Oahu Hawaiian scared places and historical places or as much as we have time we can take you to have special Hawaii Aloha day. Please contact us, any requests are welcome. You don’t have to swimming with 50 people, you don’t feel be ignored by tour guide. We do only small group (maximum 10 people) or private tour. Be personal, we care, we work, you enjoy! Highly recommend on TripAdvisor Things to do in Honolulu. Hawaii Oahu Tour with Professional Underwater and Nature Photographer. New mask! Piranha by Sporasub. This mask came out in 2013. This allows for a reduction of more than 30% of the inner air volume. The field of vision is much wider, approaching to the natural field of view. The glasses of this mask are thinner (only 2mm) and the overall weight of only 121gr makes it one of the lightest masks on the market. The mask also features great comfort and fitting. In Hawaii, it is really hard to find something good items in the store. I have to look for always online so that means I cannot try them. Fortunately this mask fit my face really good. I can’t wait to try in water! 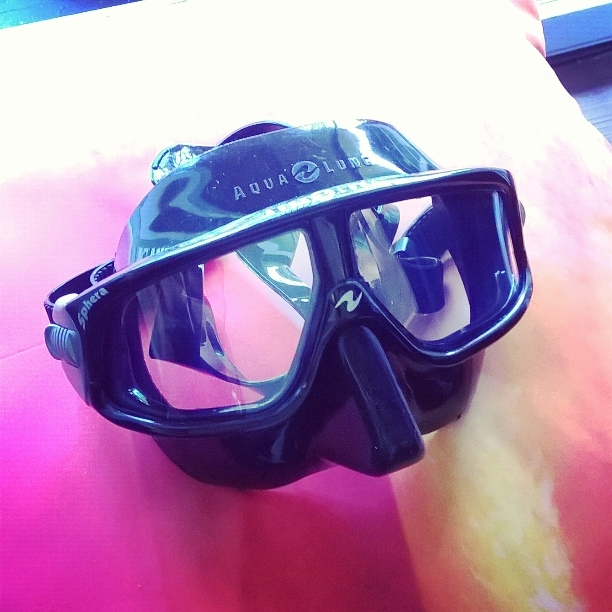 I purchased aqualung freediving mask Sphera while ago which is very popular mask in freediving. It is curved lenses provide true 180-degree visibility for maximum awareness while swimming. Lenses are plastic. You need to extra care for this. It is very easy to scratch. by the way this is not a reason I had to purchased another one. It is CURVED lenses that gives me sea sick in 3 seconds. My husband tried it who never gets sea sick but he said same thing. I could not swim for 30 min. This is really, worse mask I ever tried. I also notice a vision is different too. I thought the depth is only 10ft or something but it is 20ft. We go that place all the time so I kind of know the site, depth etc but that time with this mask i felt so weird. I don’t recommend this mask who gets sea sick. 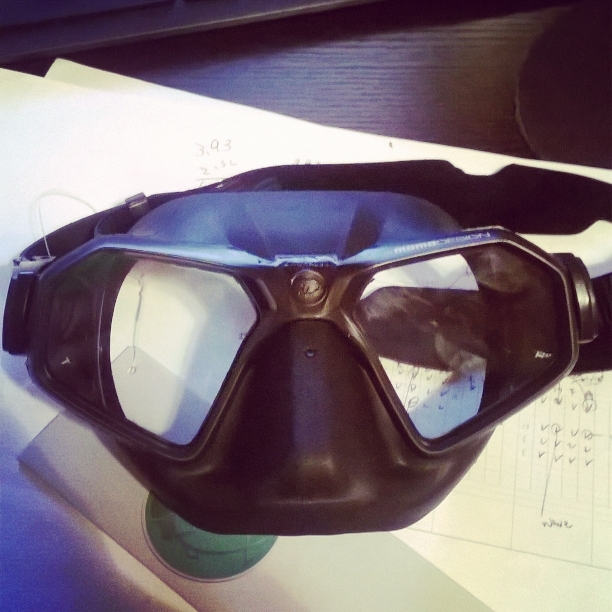 I have got a new freediving mask, longfin. First time tried these in the water. Sharks cove North Shore Oahu Hawaii.